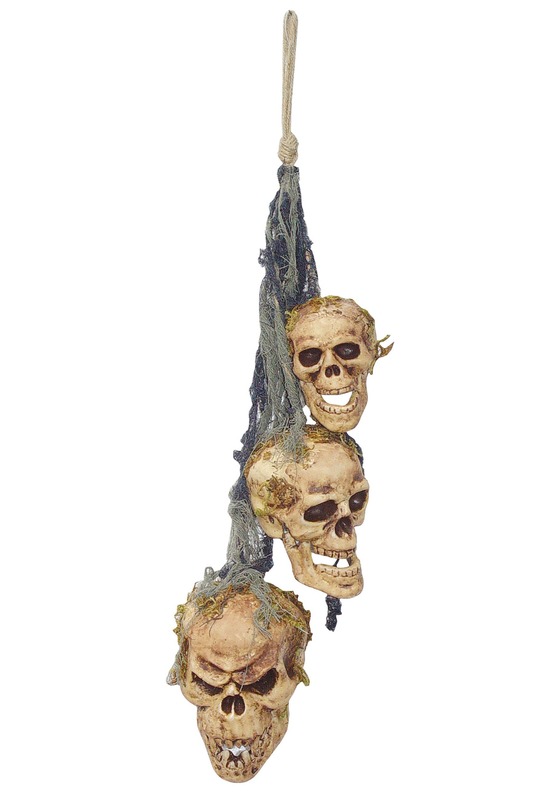 What haunted house is complete without some rotten skulls hanging from the ceiling? None that we'd want to visit! Take a look at this Hanging Rotten Skulls decoration. It will be perfect for your porch to let your guests know that they've come to the right place for some good ole fashion scares. Hang this trio of skulls anywhere in your home, as well. In the entryway for an instant scream from guests walking in the door, or right around a corner in the hallway to catch a handful of friends off guard. Where ever you decide to let these boneheads hangout we guarantee that they'll do their job and do it well. Raising some heart rates is what these guys are dying to do. Goosebumps are the only things they like to hand out, and after years of rotting, they've gotten extremely good at it. Grab this haunting décor and make your home the spookiest on the block this Halloween.